The owners of one of Scotland's most renowned and beautiful privately owned islands are having open discussions with the local community about the possibility of a community body buying it. 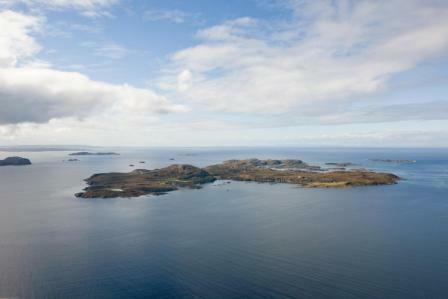 At 800 acres Tanera Mr is the largest of the Summer Isles archipelago, a group of exquisitely beautiful islands lying off the north-west coast of Scotland. With evidence of inhabitation stretching back to Viking times, Tanera Mr has always been the most significant of the islands, its freshwater lochans and sheltered, deep anchorage providing a safe stopover on northward sea journeys before the nearby mainland port of Ullapool was established. The landscape at Tanera Mr is one of outstanding beauty and from its highest point has views over sheltered bays, hidden lochans and traditional cottages, all with the breathtaking backdrop of the neighbouring Summer Isles and mountains of the mainland. The horizons provide a wonderful display of; the Outer Hebrides to the west, the mountains of Coigach and Assynt to the north and east and the Fannich and Torridon hills to the south. In the 1940s Sir Frank Fraser-Darling, the famous naturalist, was resident on Tanera Mr, studying the habitat of its bird colonies and reclaiming derelict land to agricultural production. There followed various different ownerships until the current owners, the Wilder family, bought the island in 1996 after selling their dairy farm in Wiltshire. The Wilder family have been resident ever since and the Island is currently managed by their daughter Lizzie and her husband Richard Williams. Their ethos in managing Tanera Mr has been that of minimising interference with the natural ecology whilst using its existing assets to create a self-sustainable economic environment. The Wilders have planted over 164,000 native trees as part of an on-going planting and regeneration scheme. With no sheep or deer on the island these trees have flourished creating a lush and green landscape: once windswept paths are now sheltered by semi-mature trees and the approach to the island is softened by the woodland which comes down to the coastline. The Wilder family see themselves as very much part of the local community and have had initial discussions with community representatives to establish whether a community organisation would be interested in buying the island. Lizzie Williams said: "After many happy years of calling Tanera home, it is time for someone else to have the privilege of working and living in this amazing place. We wanted to be proactive and have had open talks with the local community about the possibility of them taking over Tanera. If there is a genuine desire amongst them to do so we would be very pleased. If the community decide not to proceed Tanera will be offered on the open market, most likely in the spring of 2013." Tanera Mr currently sustains a successful tourist enterprise which comprises; self catering holiday lets, creative and active residential courses, a RYA-recognised sailing school and a caf and post office which cater for tourist boats from Ullapool and Achiltibuie as well as cruise boats, yachts and sea kayakers. John Bound from our Inverness office representing the family said, "The community have not formally registered an interest in buying Tanera Mr but the family want to be totally transparent about their plans and give the local community the option to buy it should they so wish."